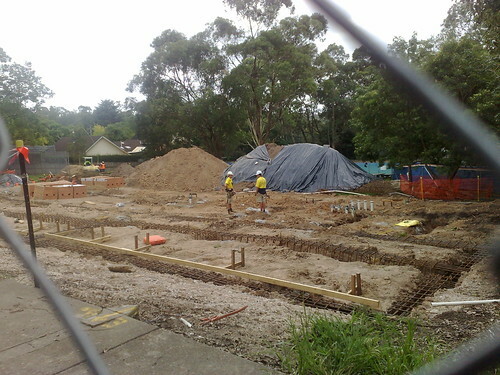 The building works at my kids’ school – they’re getting a new library, new loos and 2 new classrooms, all part of the BER government spending spree. 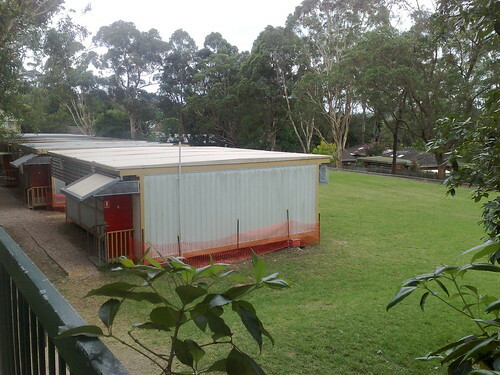 The demountable classrooms that used to be where all that building work is going on had to be relocated to the oval, so the kids are missing half their sports field till it’s all completed. Luckily there’s a local park with a nice big oval just up the road so the kids can walk there for sport. There’s a bunch of other work been going on around the school too, one of the buildings had a new roof put on, lots of painting and re-carpeting has been done and part of the playground has been resurfaced. I mourn the loss of the pavers, they were so much more aesthetically pleasing, but OH&S decreed that the trip hazards must go. It doesn’t look so bad really. Back at home we’ve had some very persistent visitors to our back deck lately. They hang off the flyscreen at the door and screech demands for food. I gave in. The cardboard box really needs to be replaced with a proper bird feeding platform one of these days. 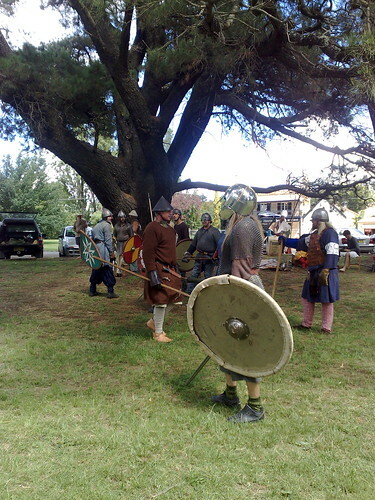 On Saturday we headed off to Berrima for a combined groups training day for reenactment combat. I wasn’t fighting, unless you count finally conquering the tablet weaving that I’d been avoiding finishing for months because the cardboard tablets I’d improvised while at a friends place were so horrible to use. Adam collected a nice batch of bruises, Tom and Caitlin spent the day climbing trees, Clara basked in the abundance of attention from dog-lovers galore and David gave his iPod a good workout. WOW! How lovely are those visitors??? I'm sure the new library will be well-loved! Congrats for the School!!! It's so rare anything gets done for schools these days, so I am soooo happy for you! If they should go to real battle I'm not sure how they would survive – they look quite lazy to move! LOL! Oh, thank you for stopping by and I love the photos you have shared today, investment in the future with the school's improvements, the gorgeous birds, I definitely do not get those in my garden and I love the look at the past with the Vikings. I have also become a follower. Wow. 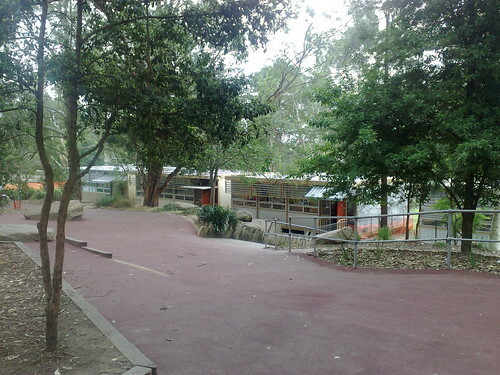 So excited about their new school : ) It is annoying during the process though when everything has to be relocated! I hope it gets finished quickly! I LOVE your header and your necklaces are beautiful! Im super envious of your bright and beautiful visitors and congrats on getting new classrooms for the school! The rainbow lorikeets are just gorgeous. Lucky kids getting all those new things at the school. Sounds like you had a good Saturday too. Great photos, I love seeing money being spent to improve schools so many are in need of updating. Have a wonderful Sunday! Congrats on the improvements! It's not often over here that that happens!! I'm sure they will be well loved and enjoyed. Your visitors are just gorgeous! It's amazing to me to see such beautiful creatures outside your window. If I ever wanted to see such animals, I have to go to a zoo or the pet store!! Looks like fun! I can't believe those birds are WILD! Wow! So jelly about your bird visitors 🙂 We have quite a few round our house, especially in the fig tree at the moment! But no rosellas. From school to battle, I love the journey of this post. You feathered friends are quite attractive. Yeah for the school construction! Those are GOOD government dollars at work. Great job on SIMC. Thanks for sharing. how funny that i stopped by your blog, and was reading thru and was about to comment on this post, and see all the crew from SIMC. i need to wake up! I was going to say my old school friend is into this…i'm wondering if you know her, Lynette. she had photos on her blog a little while ago too. @Dina & AoJ The new school building is pretty cool. I have to say that spending money on the schools was a particularly awesome way to stimulate the economy – certainly beats handouts to big business or tax cuts for the rich! @BLOGiste All those weapons are real in all respects, aside from being blunted, if anyone used them in earnest there'd be broken bones and blood galore! @Sonya Thank you 🙂 My header is a photo taken in my front garden. @Cathy Saturday was good, we finished it off by going out to The Prophet in Surry Hills for dinner – yum! @Frau There are never enough resources to go around for schools so it is great to see all this work being done. @Julie I look forward to getting to know you too! @Mrs4444 They'll eat from our hands too sometimes! @UM Perhaps not that far to travel? 😉 The reenactment thing is lots of fun – the kids are learning history without even noticing! Those birds are beautiful! Fun activity to be involved in – has that got anything to do with you going to ride a horse? I'll say what everybody else said, because it's true: Those birds are awesome. Thanks for sharing these photos. 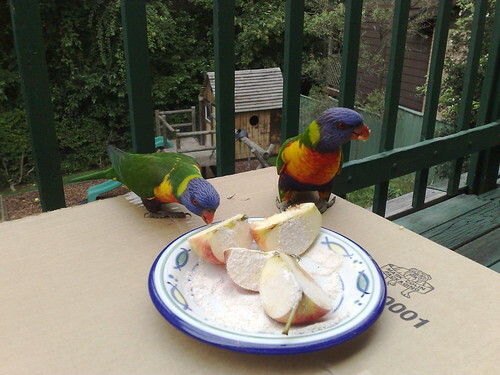 The rainbow lorikeets are terrific. Love the pics, 'specially the birds. 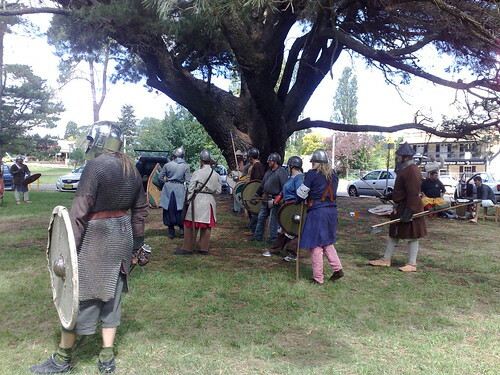 I wanna fight in that reenactment! It looks like brilliant fun.